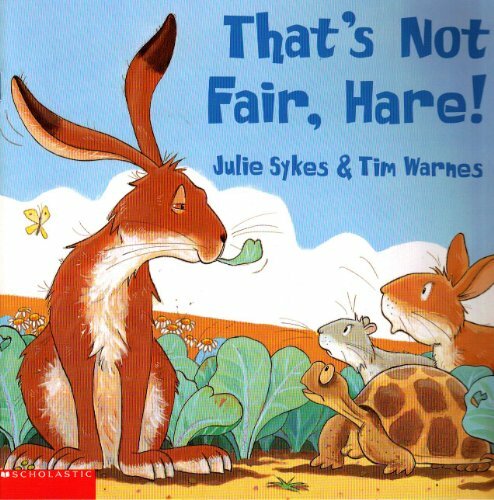 Julie Sykes That's not fair, hare! Kids will love this comically illustrated story! Everyone knows the fable called The Tortoise and the Hare, but this version of that old tale has surprises and laughs that aren't in the original. Greedy Hare challenges Muggs the turtle to a race—and the prize is Muggs's favorite food: cabbages. Muggs gives the race her best effort, but turtles can't go very fast under the best circumstances, and the crafty hare has a couple of sly tricks up his sleeve. It looks as though Greedy Hare is going to win, until Muggs shows that she's a clever turtle with a few tricks of her own. Funny, full-color illustrations on every page. Julie Sykes taught elementary grades in England from 1987 until 1995, when she became a children's writer full time. Since then, whe has had several books published, one of which won the Nottinghamshire Book Award in the U.K., and another that won the Dutch Librarian's Association Book Award. Tim Warnes is best known in Britain as illustrator of the popular Little Tiger books. He lives in Somerset, England, with his illustrator wife, Jane Chapman, and their new baby. Preschool-Grade 3--As in other versions of this classic fable, Hare is confident about his speed and is certain of his victory in the race against a turtle. However, in this retelling, the winner gains rights to a field full of cabbages, and the spectators immediately sympathize with the kindly Muggs, whose initial suggestion to share was scorned by the greedy, rude hare. It is the turtle's very kindness that costs her the race; she stops to help her friends along the way instead of concentrating on overtaking her sleeping foe. But the joke is on Hare when the clever turtle challenges him to yet another race, only to arrive "home" in her shell before the selfish hare takes off. The chalk-on-oil illustrations provide green backgrounds in the meadows, forests, and cabbages for the brown Hare and turtle. Although there are many variations of this tale, this one strikes such a nice balance between expressive illustrations and a read-aloud text with a slight twist. 1. That's not fair, hare! 2. That's not fair, hare! 3. That's not fair, hare! 4. That's not fair, hare! 6. That's not fair, hare!